As always, each NAB Show is an opportunity for manufacturers to exhibit new products and platforms to the broadcast industry, and this year’s expo will continue that. However, as broadcast audio moves deeper into an IP/IT paradigm, those new releases increasingly take the form of software and are networked. Calrec Audio (Booth C7408) is showcasing its latest virtualized solutions: VP2 headless mixing system, RP1 2RU rack-mount broadcast mixing system, and Type R modular IP-based system. The VP2 virtualized mixing system has no physical control surface and uses Calrec’s Assist software for setup and control. Its 4RU core comes in three DSP sizes; 128, 180, and 240 input channels and incorporates the Hydra2 networking solution. Calrec Serial Control Protocol (CSCP) allows the audio console to be completely controlled by an automation system. The RP1 broadcast mixing system provides solutions to the three major challenges in remote-production workflows: latency, transport, and control. On-board DSP enables generation of monitor mixes and IFBs onsite with no latency, Hydra2 interfaces provide a mechanism to output audio in a variety of formats, and Calrec’s True Control gives an operator in a remote studio direct control over channel functions. A modular, expandable, IP-based mixing system, Type R uses standard networking technology, combining it with configurable soft panels, and can be used without a physical surface with control and setup via the browser-based Assist application; it is fully compatible with automated systems using CSCP. Power Core, Lawo’s (Booth N2503) AoIP mixing engine and I/O node, will showcase new features and capabilities debuting at NAB 2019: a Dante card with dual-redundant ports and sample-rate conversion, allowing easy integration of pro-audio equipment into broadcast environments; dual-redundant front-panel SFP ports for AoIP providing broadcasters with a choice of optical or copper network connections without the cost of external media converters; and ST 2022-7 Seamless Protection Switching, which provides dual-redundant AoIP network connections. Power Core users can add capacity with eight rear-panel card slots, which allow à la carte addition of analog, AES3, MADI, and Dante interfaces, and a Studio I/O card that provides mic inputs and headphone and monitor outputs. 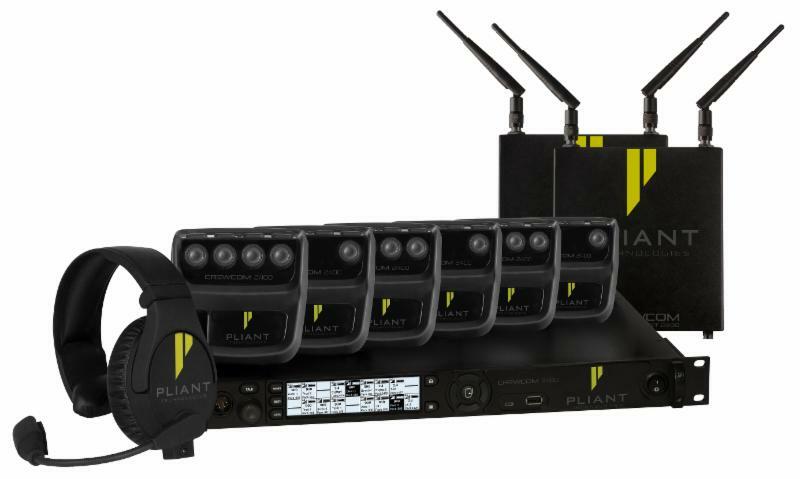 Pliant (Booth C8548) will showcase the latest updates to its CrewCom wireless intercom system, along with its newly enhanced SmartBoom LITE Headset, Drop-in Charger, Fiber Hub, and the new FlexLR connector. The newly released CrewCom firmware update provides numerous system improvements as well as incorporation of new Oceania 900-MHz models. The newly enhanced SmartBoom LITE Headset features an improved dynamic noise-canceling microphone with wider frequency response; increased sensitivity; an enhanced speaker with wider frequency response; reduced distortion; and an updated foam ear pad for added stability and comfort. 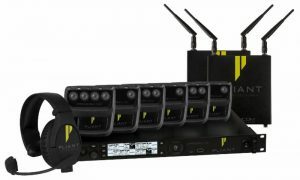 The Drop-in Charger allows six Radio Packs plus six additional batteries to charge in the same device for more-effective battery management on location. The CrewCom Fiber Hub expands system capabilities for more-efficient system deployment by allowing up to eight fiber connections using standard SFP-based connectivity supplied with single-mode fiber ports and a single RJ-45 copper port to interface to existing CrewNet connections. The addition of a compact FleXLR gender adapter gives users the flexibility to connect headsets to devices with non-matching four- and five-pin XLRs, such as CrewCom Radio Packs or control units, while also enabling customers to choose from a larger range of compatible headsets. New for 2019 from Quantum5X (Booth C1539) are two wideband true-diversity receivers, both tunable from 470 MHz to 700 MHz in 25-kHz steps. The Q5X QR-3200 dual-channel rack-mount is networkable, with a computer interface that allows easy control and monitoring of all receiver settings. The Q5X QR-M3 mobile receiver has a large display and highly functional user interface, including an RF scanner and up to 32 presets for rapid channel selection. Both new receivers cover the entire tuning range of Q5X family of wireless transmitters, the QT-5100 remotely controlled units, and the QT-300 manual units. Sanken (Booth C6046) is showing its new CS-M1 super-cardioid shotgun microphone. At only 4 in. 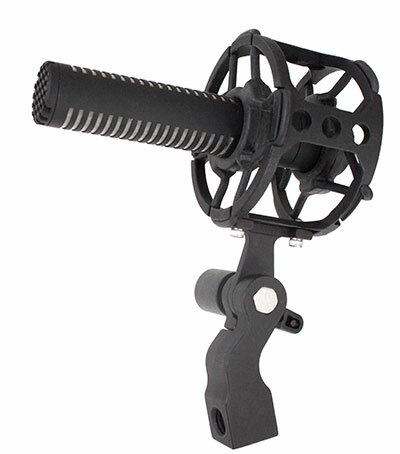 long and weighing less than 2 oz., the CS-M1 can be used in tight mic situations. Like all Sanken shotguns, it is rugged and dependable with a wide range of applications where sound clarity and noise rejection are critical requirements. It can be camera-mounted without interfering with even a short lens yet still provide the quality of audio demanded by today’s professionals. Solid State Logic (Booth C3026) will release Dynamic Automation Software (DAS) for all System T broadcast-production mixing consoles, S500, S300, and TCR at NAB 2019. Available as a software option, DAS expands System T’s capabilities. Automated parameters on the console are stored with mixes against MTC or LTC and managed from within the console’s file system. Touch-sense faders and encoders and touchscreen controls provide multiple ways of writing automation data across all processing on all channel and bus paths. The Dynamic Automation Software option will be available May 2019. Wheatstone’s (Booth N6806) new SwitchBlade 1RU appliance for the WheatNet IP audio network will introduce a new AoIP appliance that features audio codecs, SIP messaging, and ACI control interface intended to reduce barriers to seamlessly sharing studio operation and high-quality programming among facilities, sports venues, and other sites in separate locations. Billed as “the first product of its kind to combine the power of AoIP logic control with SIP connectivity and codec bandwidth optimization to transport both high-quality programming and the control logic critical for full studio operation between sites,” SwitchBlade makes it possible to monitor each point of the audio chain and switch audio locally from network-operation centers around the world. WheatNet-IP is an AES67-compatible network for interfacing with other AES67-compatible devices or environments.